Bharat Nalluri’s The Man Who Invented Christmas recounts the journey that led Charles Dickens (Dan Stevens) to write his famous novel A Christmas Carol. Struggling with career doubts and economic pressures, Dickens saw the new book project as a quick way to redeem both his ambition and pocketbook. But in wrestling with his story and its unruly characters, Dickens undergoes a plight not unlike his famous creation, Ebenezer Scrooge (Christopher Plummer). Dickens finds himself not simply composing a Christmas story, but living one as well, discovering through the process of writing a newfound gratitude for his friends, family, and life and a renewed belief in the power of giving to those in need. The actor Simon Callow, who is also a Dickens scholar, explains how the film, by using fantasy and realism to illustrate Dickens’ profound transformation, “is cinematically and narratively inventive in the same way that A Christmas Carol is narratively inventive.” The spectacular success of Dickens’ volume has led to many more Christmas stories over the years, tales that attempt to capture the magic of the season and our joyful embrace of the Yuletide spirit. As The Man Who Invented Christmas joins the fine tradition of Christmas movies by recounting the story of how Dickens’ novel established the custom, we recall some of our own favorite holiday films. 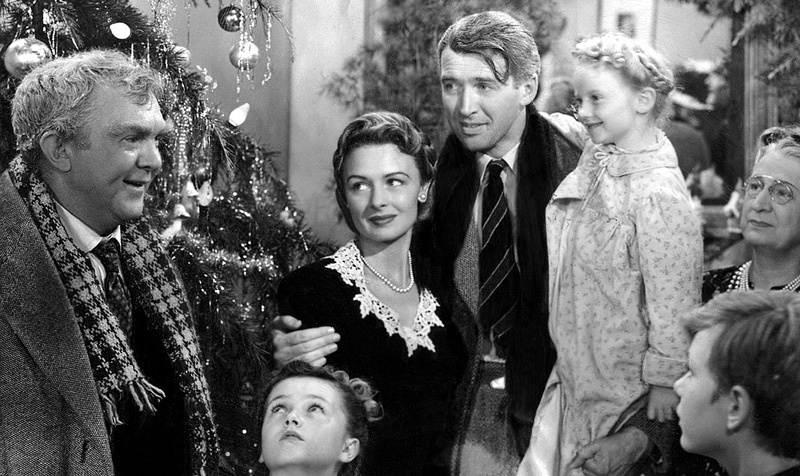 In many ways the history of how Frank Capra’s 1946 It’s a Wonderful Life became a holiday classic defines the magic of the season as much as the story it tells. The film’s history began in 1938, when copywriter and part-time historian Philip Van Doren Stern woke from a fevered dream with the shadow of an idea. Over the next few years, he transformed that into a 4,000-word tale called “The Greatest Gift,” a short story that he turned into a holiday present when he could not find a publisher. Printing up 200 copies, he sent his creation out into the world as Christmas cards, with one finding its way magically into the hands of Cary Grant’s agent who took it to RKO Pictures. A few years later Frank Capra bought the scenario for his new company, Liberty Films. It would be both Capra’s and star James Stewart’s first movie after many years of war service, a film that both infused with a fragile belief in peace on earth. But its post-war promise never materialized as the haunting tale of George Bailey (Stewart) learning how much his life matters to others stalled at the box office. Nominated for five Academy Award, it didn’t win any. A few years later, its prestige went from bad to worse when Ayn Rand and other anti-communist ideologues singled out the heartfelt tale of caring for others as anti-American. In its hefty FBI file, the film is accused of being “written by Communist sympathizers,” “attempting to instigate class warfare,” and “demonizing bankers.” But just as its fate seemed as sealed as Bailey’s was atop that snowy bridge, shifting economic and technological forces saved it. 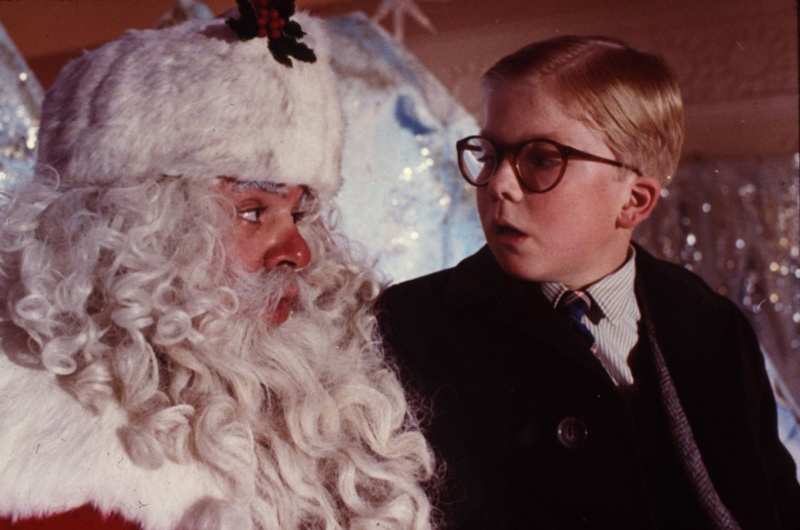 By the 1970s, the fact that the film had fallen into the public domain made it a favorite for TV stations looking for free content to run during the holidays. Within a few years, It’s a Wonderful Life was played every December, quickly becoming a centerpiece of family life and a holiday tradition. In 2006, it topped the AFI’s list of America’s Most Inspiring Movies. 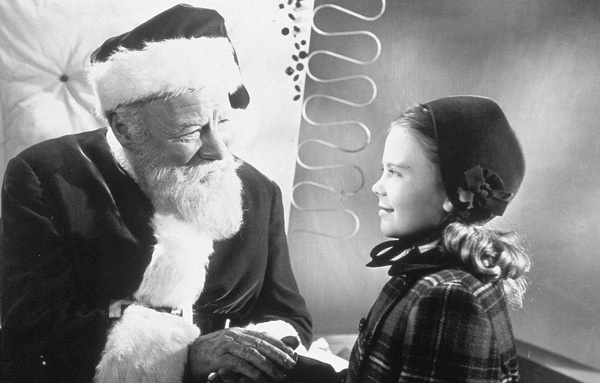 Miracle on 34th Street inspired a confidence in its creators that is matched only by the unshakable belief of the film’s young heroine (Natalie Wood) that a Macy’s store Santa (Edmund Gwenn) is the real deal. Valentine Davis, who was inspired to write the story while online at a big department store one Christmas, knew immediately his tale would make a hit film. Writer/director George Seaton agreed, immediately coming up with a workable screenplay. 20th Century Fox Studios’ Darryl F. Zanuck rushed the project through, endorsing the story as “excellent, fresh, exciting and delightful.” Fox cast John Payne as the lawyer defending Kris Kringle, the beleaguered store Santa, and Maureen O’Hara as the Macy’s executive whose daughter stands by Santa to very end. Angry at being forced back from Ireland to make the movie, O’Hara changed her tune once she’d read the script. “It was warm, charming, and sentimental, but more than anything, it captured the spirit of Christmas,” O’Hara writes in her autobiography Tis Herself. “I knew the movie was going to be a hit.” The studio was so certain of the film’s success that they didn’t even get permission upfront from Macy’s or Gimbels, even though both stores are heavily featured in the film. After seeing the film, both companies not only approved, but set up big promotional tie-ins. Wanting to get his movie out as soon as possible, Zanuck made the unprecedented decision to release this Christmas story in June. 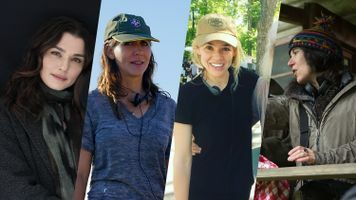 The movie proved not only a summer hit, but continued to have a box-office success all the way into the holiday season. Nominated for four Academy Awards, it won three—Best Supporting Actor (Gwenn), Best Writing, Original Screenplay (Davies), and Best Writing, Screenplay (Seaton). The power of this charming story continued long after its release, going onto be remade several times for TV and cinema, as well as be adapted into a stage play and musical. Although Michael Curtiz’s hit holiday film White Christmas was release in 1954, nearly a decade after World War II ended, the film’s success, and even its plot, is rooted in that conflict. Bing Crosby first sang the sentimental Christmas carol on the radio in 1941––just weeks after the Japanese had bombed Pearl Harbor. While Irving Berlin’s popular song was featured in the 1942 film Holiday Inn with Bing Crosby and Fred Astaire, it really took off when it was added to the Armed Forces Radio playlist, poignantly permitting thousands of soldiers to dream of their own snow-covered homes during the holidays. 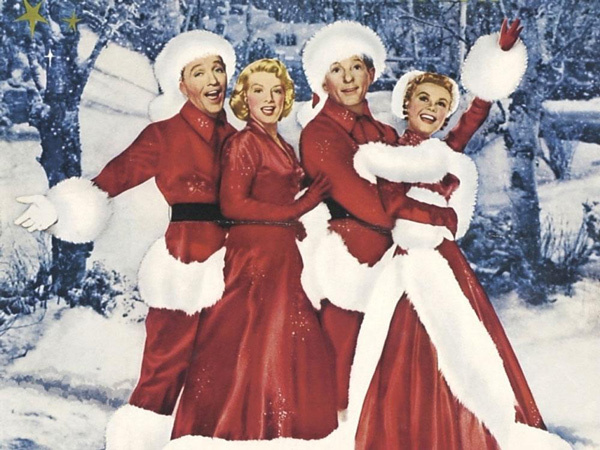 The song “White Christmas” became so popular that it reigned as the best single of all time for decades (until Elton John’s Princess Diana’s elegy “Candle in the Wind” replaced it). After the war, Paramount wanted to capitalize on the song’s popularity by pushing forward White Christmas, a film that would unite Crosby and Astaire to tell a story about two World War II veterans coming together to help out their old commanding officer. But casting proved difficult. Astaire didn’t like the script, and the studio’s second choice, Donald O’Connor, became sick before he could join the production. Paramount settled on Danny Kaye to avoid losing any more time or money. Rounding out the cast with Rosemary Clooney and Vera-Ellen, the film, shot with Paramount’s new high-resolution VistaVision process, became a brightly wrapped Christmas gift for audiences. Not only was the film a smash, becoming the top grosser of 1954, but Berlin won an Academy Award for Best Music, Original Song—oddly not for “White Christmas,” but for “Count Your Blessings Instead of Sheep.” “White Christmas” won twelve years earlier for Holiday Inn. Love Actually’s writer/director Richard Curtis never intended to make a holiday film. 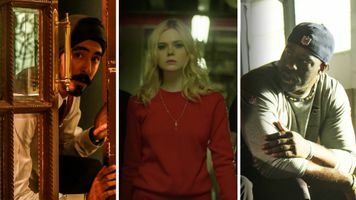 Inspired by the multi-character episodic narratives of Robert Altman and Quentin Tarantino, Curtis had started developing a film exploring the many splendored nature of love. But as he started weaving together his film’s various narrative threads he decided to set his stories during the holidays. “I love Christmas movies so I thought I’ll make a Christmas movie,” Curtis explained to VH1 News. 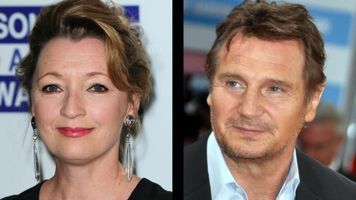 “It didn’t occur to me that it might be one of those Christmas movies where people actually watch it again and again.” With a massive cast, including Alan Rickman, Emma Thompson, Hugh Grant, Keira Knightley, Colin Firth and more, Curtis strings his ten tales of love, desire, heartbreak and infatuation around the central theme of the holiday season, filled with drunken parties, gift giving, seasonal songs, and even the crush of travelers at Heathrow Airport. For some, the film’s Christmas sprit lays not just with its decorative background, but also with the generosity of his storytelling. 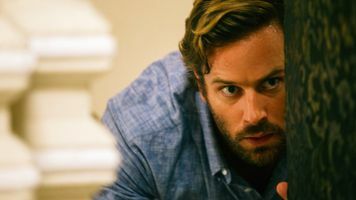 “Slathered in eye-candy icing and set mostly in London at Christmas, [the film] serves sundry slices of love—sad, sweet and silly—in all of their messy, often surprising, glory,” extols USA Today. 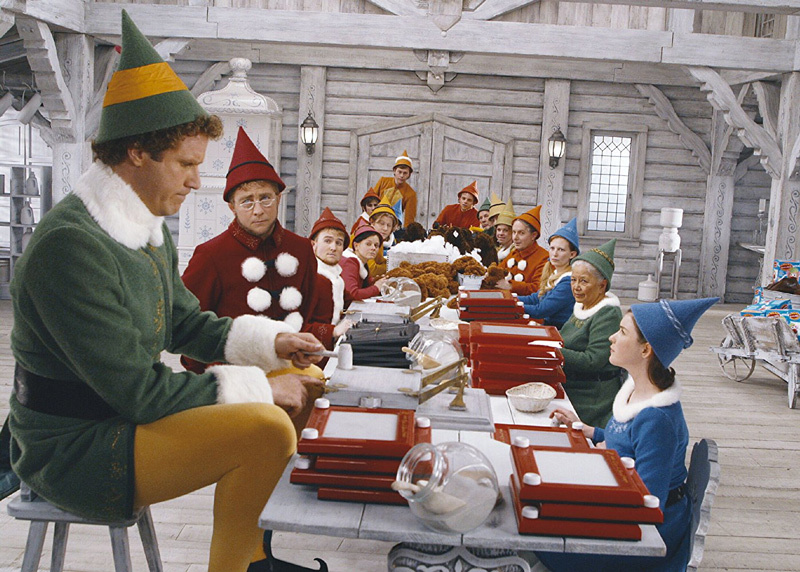 In any case, the film that never set out to be a Christmas movie topped Radio Times’ 2016 poll of Britain’s favorite holiday movie.